Today we honor National Adoption Day, in the hope that we can help raise awareness for those babies - both two and four-legged - who are in desperate need of a home. There are more than 100,000 human children currently in foster care, awaiting adoption. And there are between 5 and 7 million pets in shelters, awaiting their forever homes. Please... as you plan your family, as you consider major life changes... consider adoption. And so today we feature our oldest adopted "child," Allie. Is it just me, or do I sense a touch of indifference in that face? Of course, if a rose is brought into the house, it's invariably for her, not me. I suppose one might become a bit indifferent after so many offerings. 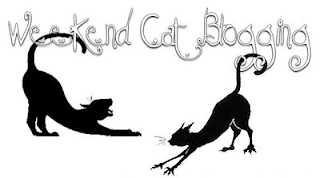 We're also participating in the Weekend Cat Blogging blog hop. We hope all of those in need find a forever home soon. Have a super Saturday. Great post and even greater photo! Happy Caturday, furriends. Allie, Mommy found some nail caps recently but couldn't get any in pink. She thought of capping Tutu's nails as she has drawn quite a lot of maps on her. MOL. Are your hind paws nails capped too? Allie: oooh Tutu would look gorgeous in them! We order the colors online, because the pet store only has clear. And I only get mine on my front (though Mother does clip the back periodically). the nail caps generally have too much of a curve on them to fit on the front claws to fit on the back ones.. I used them for Jack for a while..
We hope for a day all children and animals can have a home... thank you for sharing this message! We are very pleased to say that our newest adoption, Kizmet is doing great and I highly recommend everyone add another pet to their lives if they can! We so agree on the adoption message, for both furry and hairless children. We love the photo of Allie with the rose. Purrrrrrrrrrrrrrs. This is a very nice post! I liked that you linked little humans with pets. Adoption is important. Allie, you look so beautiful with your pink toenails and little pink bell! I love her pretty pink nails! I always wondered if those work or stay on... looks like they do for her! Your adoption message, for both furry and hairless children are very important to think off ! 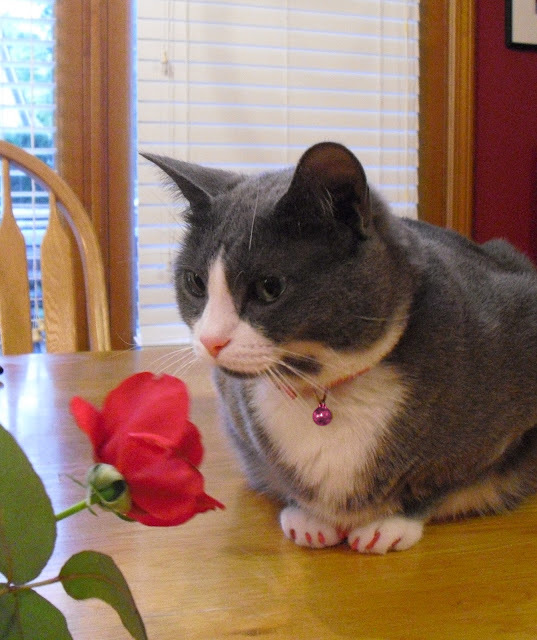 Allie, flowers are for eating! We didn't know it's National Adoption Day! Both Glogirly and I were adopted and so was Glogirly's stepson, Gabe! pink manicured paw waves to Miss Allie! We love your mani/pedi, Allie. And we love your post. Coincidentally, I featured some adoptable kitties from Kitty Bungalow on my blog today! I adore that photo of Allie.